A5 Diet Diary, Slimming Diary, Compatible With any Dieting Plan, Wire Bound. You Can Do It. 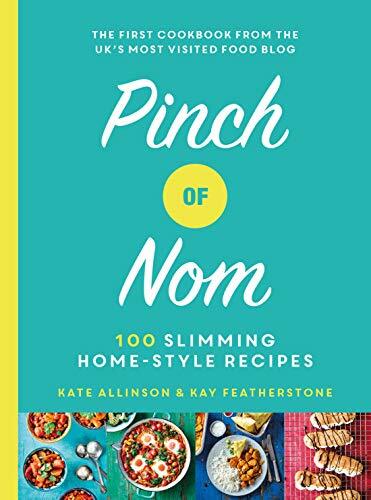 Pinch of Nom is the first printed cookery book from the people behind pinchofnom.com - the UK's most visited food blog, and will help both novice and experienced home cooks to enjoy creating exciting, flavourful and satisfying meals. And, happily all the recipes are compatible with the principles of Weight Watchers and Slimming World. It's not just for paid-up dieters though; this lovely book, with its full-colour photography, is full of inspiring, easy-to-make dishes that are just plain tasty, but have the advantage of being low in calories - not that you'd guess. Whether it's Cumberland Pie, Mediterranean Chicken Orzo, Mexican Chilli Beef or Chicken Balti, this food is so good your family and friends will have no idea how tiny the calorie count is. The recipes are labelled with helpful icons to guide you towards the ones that suit you best - whether you're looking for something veggie, fancy a home-made 'fakeaway', want to feed a family of four, or have limited time to spare. If you're a member of any slimming club, you'll know that the help and encouragement of your fellow slimmers can be key to helping you shed the pounds and stay motivated - and pinchofnom.com was started to do just that. Chef Kate and her friend kay were restaurant owners who wanted to share their skills and help others learn to cook and share delicious and healthy meals that just happened to be low in calories. Within just 2 months, their approachable recipe-writing style had gained over 8,000 followers, and now, this sensational blogging duo are famous for their delicious low calorie creations - and have over 1.5 million followers. Hardback, 272 pages. 100 recipes.